ISTANBUL—Protests that started Friday in Istanbul intensified Saturday with both police and protesters turning out in greater numbers. Protesters wearing gas masks marched Saturday towards Taksim Square, which has been at the center of the protests. Police used large amounts of tear gas to disperse the protests and put up blockades on the square. In an apparent attempt to calm tensions, police retreated from the square later in the day, allowing thousands of protesters onto the square. Chaos erupted in Istanbul Friday after police forcefully ended a sit-in protest against the construction of a shopping mall on a park’s grounds. “It’s not about a park, it’s about the abuse of state power,” said one protester, who wished to remain anonymous. She had flown into Istanbul from the city of Bodrum, located 500 miles away. “It’s about media being censored, it’s about democracy! It’s about police attacking innocent people,” she said. The protests have revealed a deep anger in Turkey against Prime Minister Recep Tayyip Erdogan, who has been criticized as being increasingly authoritarian. 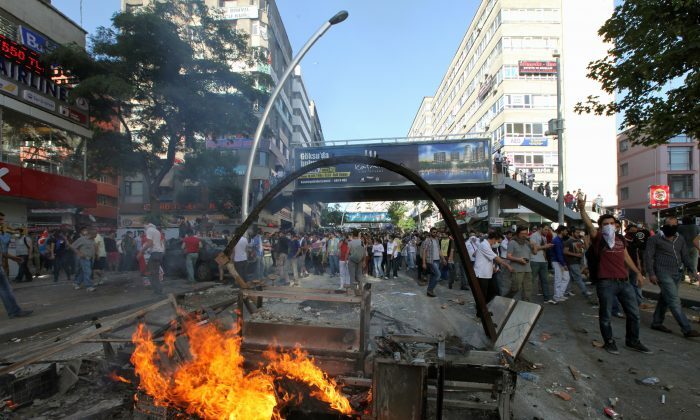 Protests continued to spread to other cities in Turkey on Saturday. In the capital, Ankara, police used tear gas to disperse protesters, and serious clashes between protesters and police were reported. Turks in other places around the world, such as London and Dubai, have also come together in support of the protests. The protests have been driven by social media, which serves as the main information source for the protesters. Both protesters and the public have complained extensively about the lack of local media coverage of the events. Turkish Prime Minister Erdogan called on protesters Saturday to end their protests. “I’m warning those who came there with honest feelings, they have been subject to illegal groups, they should not comply with them. I plead that they immediately end this protest,” he said at the 20th congress of Turkey’s Exporters Assembly, according to Daily Hurriyet.